Hey, nice to see you again! You’re looking good! Have you been working out? Me? No, no, I am still in hibernation while trying to decide whether we should all get together and protest against whomever thought it was funny to include March in the Spring season. It’s kind of a cruel joke, don’t you think? Thank God (or whatever Higher Entity you deem appropriate) for Playground! Out of a sudden last-minute change in the line-up we ended up with a completely unplanned but nevertheless beautiful thematic coincidence. You know our little habit of starting the evening with a sort of game, right? The game we had chosen for last week’s session was a pseudo-Dada exercise called Fruit Salad. 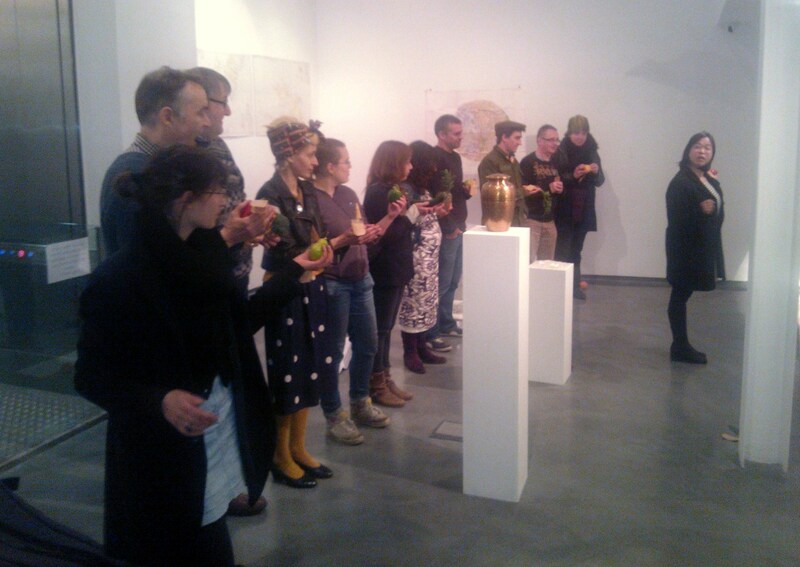 It involved fruit, shouting words about fruit and then accompanying the fruit and words with gestures. We really hadn’t expected the length into which some people can let their imagination go to given the simplicity of the instructions. We had “anarchist” tomatoes turning into hand-grenades, “juicy” oranges squeezed open all over the floor, “soft” apples being caressed tenderly… It was really funny and only slightly messy. The first round of the evening was an Uncooked by Karen. 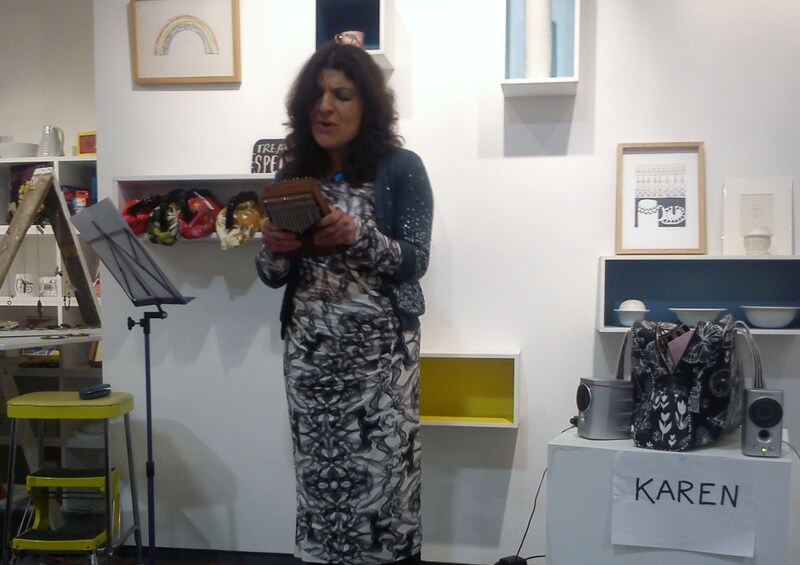 Karen is a singer and she had this idea about developing a show using nothing other than her voice and what can fit inside her handbag. Of course one of the things she brought was an mp3 player but she calmed down the skeptics by saying that the only track on the player was a backing track. Her singing was beautifully strong and fragile at the same time and she bravely raised up to the challenge of the handbag sized orchestra, with skill and playfulness, by producing a different item to accompany her to each song. From an unusual small wooden trapezoid musical instrument to a crocodile hand-puppet, her orchestra “members” were not only unexpected and imaginative but also very carefully chosen. Next on was the sudden change in the line-up that I was talking about earlier. Minou and Luvina Shared their Toys with us, and by toys I mean fruit and veg, or as Minou would put it “organic items”, which is certainly more accurate since there was also an egg in the menu, and eggs are certainly neither fruit nor veg, but they still qualify as organic items. 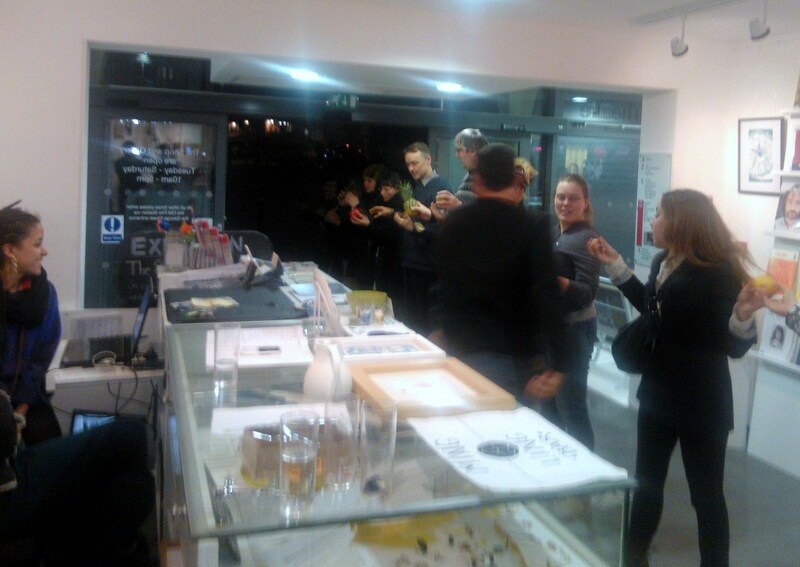 …and out into Gloucester Green and back in again, finishing back inside the Shop. Each organic item had a travel tag on and on the tag there were a set of questions or phrases relating to the traveling and the origin of each item. Minou and Luvina asked us to get a pen and add our own thoughts and responses to these questions and then place the items neatly on a line on the floor near one of the walls where everyone could then take their time to read what other participants’ had written down. It was a really fun and thought provoking piece and we wish them the best of luck with developing it further as an educational activity for children. There’s fruit, there’s rules, there’s a lot of running around… I’d love to have been involved in something like that when I was little! The 15 minute break afterwards came just in time to catch our breath, catch up with the artists and treat ourselves to a drink from the Ming*Ling Bar before coming back to experience the transformation of the space through Julian’s and Tim’s unusual duo for french horn and double bass. 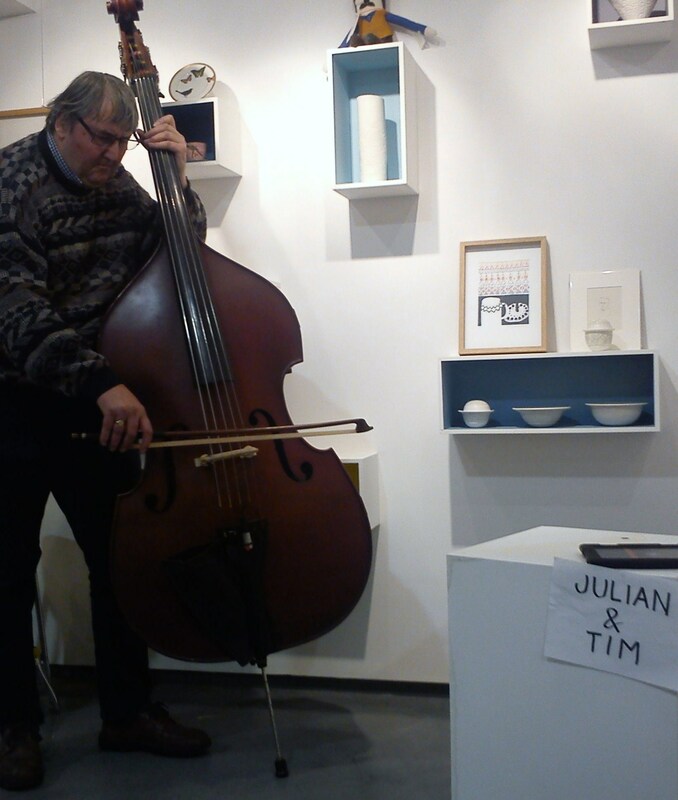 Only Tim was in front of us, with the double bass taking a prominent position in the shop floor (seriously, how often have you seen someone playing the double bass in a gallery shop?!?) and while he started playing, our ears would also catch a sound or two, a different sound, coming from downstairs. It was hard to tell where the sound was coming from -it was moving, shifting and transforming- and the focus of our hearing (is there another word to use to say that? focus seems to me to be more vision related…) was shifting with it from one room to the next. 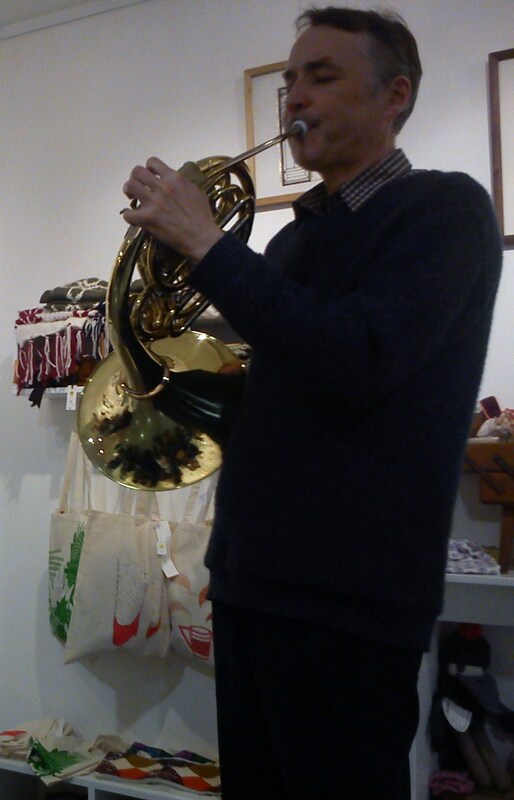 Julian suddenly started appearing up the stairs, trying to move his feet, trying to play the beautiful shiny french horn. With each step up the stairs, there came another breath, another push of air through this complex instrument, until he came up to the shop and joined Tim, and this felt and sounded almost like the end of a long journey, the light in the end of the tunnel, the paycheck in the end of the month. It is a rare occasion to see two so skilled and talented musicians embracing not only their instruments but also their whole bodies as narrative vehicles and performing both with a combination of respect and humour. 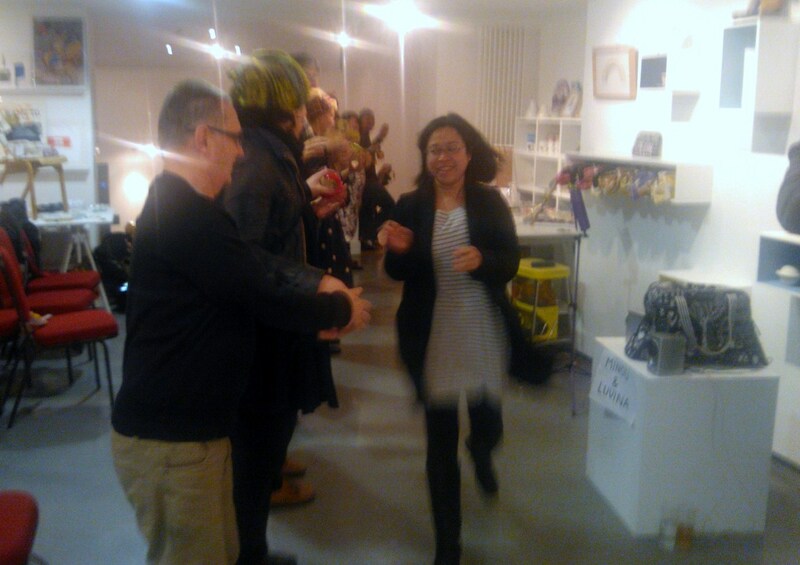 The combination of work and artists we experienced last week was truly extraordinarily diverse and it somehow managed to engage so many of our senses and it seems quite hard to believe that all these things were packed into more or less 60 minutes. There were also, of course, a couple of Instant Noodles that found their way into the evening. Martine invited people to get involved in a project she’s currently developing and she’s very interested in hearing back mostly from performers, if I remember correctly and then Dot made an announcement about the Oxford Community Radio, a radio station he’s launching, which is going to be ran by the local community and for the local community and he invited anyone who would like to get on board to contact him. Don’t forget that you can get in touch with all these amazing people through our Facebook Group. You can also use the group as an extra platform for communication, feedback, collaboration and even as a skills exchange network. If you want to get in touch with any of the Playmasters, you can click on the Contact thingy on the upper left of this screen. We always like receiving messages from you be it digital, dead-tree ones or even wrapped around a leg of a pigeon. The only type of message we’re not keen on is the pirate-style note fixed with a dagger on our front door, really, don’t do that, it’s kind of creepy. I’ll miss you guys. Hope you’re all doing great, and that you’re making each other happy. I’ll go back to my cave now and spend the rest of the evening performing the reverse-rain-dance in hope that it will rewind the rain back up into the clouds and let us enjoy some sunshine. I’ll let you know if it’s working out. Previous Post Is it the ninth one already? Next Post What is Playground?